I’m trying to put together a list of things not to do when writing undergrad essays. I want a handout that will address some of the most common problems I’ve encountered when marking, to try to stop them before they start. As long as the students read them, of course. Let me know what you think about them, and please add your own suggestions in the comments. Keep these things in mind while writing. If you find yourself doing one of them, stop, back up, and re-focus. 1) Don’t give pointless biographical detail. I honestly don’t care that Brecht was “born on the 10th of February 1898 to a devout Protestant mother and a Catholic father.” I can read Wikipedia. You’re supposed to be analyzing a specific aspect of the topic – it’s very unlikely that a practitioner’s date of birth is relevant. Think: Does the information you’re giving address the question? Why is it important? What point are you making? Does the information help you make it? 2) Don’t tell me that something was ‘unique’ or ‘controversial’. Or ‘groundbreaking’ or ‘important’ or ‘interesting’ or, to be honest, any adjective. Again, I don’t care. It’s not interesting. It doesn’t add to the argument. If something was controversial, ask why. Who was objecting? What were they objecting to? Did they have a political or personal reason for objecting? Do the answers to these questions have a bearing on the question? Ditto for other adjectives – why are you using that word? What elements of the thing are you describing? How is the effect produced? How does this answer the essay question? 3) Don’t write without a plan. If you’ve got a paragraph about elephants, followed by one on mime, followed by one on puppetry, I’ll assume you’re writing nonsense on purpose. What relation does one paragraph have to the other? How is each related to the question? How is the link related to the question? 4) Don’t make a point without evidence. It’s easy to say ‘Artaud believed that the sky was going to fall on him’, or ‘In Hamlet, Shakespeare is exploring madness’. But you could equally say ‘Sophocles wrote plays about the rise of Hitler’. Without a specific reference to the text, or to some kind of source, you can’t prove that what you’re saying is true. Use the structure point, quote, comment – know what specific thing you want to say, the evidence you’re using to demonstrate it, and how it relates to the question. If your paragraph doesn’t have any citations in it, it’s probably not detailed enough. 5) Don’t refer to authors or performers by their first name. Do you regularly go for drinks with ‘Marina’? Is ‘Will’ your housemate? No? Then call them ‘Abramovic’ or ‘Shakespeare’! 6) Don’t cite Wikipedia, the Poetry Foundation, Ask.com or any other public website. (Unless it’s a review, or a news story you’re using specifically for the spin it’s using. And even then, probably don’t). Also, don’t paraphrase them and hope I won’t notice. I probably will, and even if I don’t your essay will be worse for it. Academic books and journal articles have been reviewed by other academics, to make sure that they’re accurate, and that they’re saying something new. If you cite them, you know your information’s accurate and (as long as you’ve done your research properly) relevant. Using a public websites would be the equivalent of David Cameron using ‘my dad said…’ as an argument in parliament. Just don’t do it. Not even once. 7) Don’t end your essay with general comments about how great the play, or practitioner, you’re discussing was. The question isn’t ‘Were you really inspired by Stanislavsky?’ or ‘Is Brecht one of the most influential and innovative writers in the modern period?’ Your conclusion should make it clear what your answer to the question is, and how your essay has demonstrated that answer. 8) Don’t use filler phrases. ‘It can be argued’, ‘it seems’, ‘many have observed’, ‘some may argue’, ‘it is said to be’, ‘I believe’, ‘I think’. On their own, these just make it sound like you don’t know what you’re talking about. Be specific about who has said something, why they’ve said that, how it relates to your argument, and what evidence you’re using. The recently founded New Researchers’ Network of the Society for Theatre Research is pleased to announce its inaugural symposium on the theme of ‘Emergence’. As a term ‘Emergence’ is multi-dimensional, referring simultaneously to a movement away from or out of something else, an escape from confinement or the manifestation of something new, and recovery from difficult circumstances. As new scholars emerging in the field of theatre research, we have a heightened awareness of the difficulties facing our discipline from GCSE level upwards. More broadly, the emerging theatre scholar looks on in dismay at the issues facing higher education as a whole in the UK. For newly emergent theatre scholars and also practitioners the present economic conditions may seem inhospitable. We live in an age of slow economic recovery, where funding is limited and where the arts are suffering severe cuts from all sides. In all sectors new jobs are hard to come by, new houses are unaffordable, and new business ventures struggle to emerge. As theatre historians we also deal with issues around ‘Emergence’. The ephemeral nature of theatre and performance, constantly emerging and dissolving, raises a range of historiographical questions. We deal with emerging evidence from archives and collections and use it to develop our own research. Emerging evidence consequently brings new debates, theories and themes to the fore. How does (or how should) the theatre react to or reflect on emergent world issues and political movements? What strategies might be employed to help theatre and performance studies, and the humanities more generally, emerge from its current crises? What happens when something unexpected emerges, either from research or from practice? What happens to the things which are displaced when something new emerges? The New Researchers’ Network Committee welcome papers of up to fifteen minutes from new scholars, postgraduates and early career researchers on any aspect of the conference theme, broadly interpreted. Abstracts of 250 words should be submitted by email to nrn@str.org.uk by 21 February 2014. Notices of acceptance will be sent by 21 March 2014. On Thursday, August 22nd, I attended a symposium on art, ethics and society, hosted by Edinburgh University’s Mason Institute. It’s difficult to capture in words the energy this in–depth discussion of bioethics, humanity and the role of art had. Novelists, directors, performers, visual artists gave their thoughts on the role of art as a medium for ethical issues, and the ethical responsibilities of artists. The discussion ranged from the specific (should foetuses found to have achondroplasia be aborted) to the general (“As an artist, how do you stay safe?”). There were also moments of genuine disagreement, as a speaker from the floor argued that Sparkle and Dark’s acclaimed Killing Roger was a dangerous fantasy, since “people like that don’t seek assisted suicide”. The play’s author, Lawrence Illsley, strongly defended the autonomy of art, responding “of course it’s fantasy”. This exchange summed up the major point to arise from the discussions – Is the artist’s role to accurately reflect a tightly defined concept of ‘evidence’ or to provide something which is viable as fiction? The question is obviously unanswerable, or at least has a different answer for each act of creation at each time. What is important, as The Fantasist director Ailin Conant emphasised, is that the ethical dimensions are recognised, and space always remains open for dialogue, for learning. “Puppets struggle to live on stage, while actors struggle to die on stage” – Shelley Knowles-Dixon, Sparkle and Dark. “What right do I have to address these issues?” – Knowles-Dixon. “[Artistic ethics are about] basic humanity, basic respect, basic love” – Ailin Conant. Get your head out of your hands! If you tell an actor that his role is full of psychological action, tragic depths, he will immediately begin to contort himself, exaggerate his passion, “tear it to tatters”, dig around in his soul and do violence to his feelings. But if you give him some simple, physical problem to solve and wrap it up in interesting, affecting conditions, he will set about carrying it out without alarming himself or even thinking too deeply whether what he is doing will result in psychology, tragedy or drama. By approaching emotion in this way you avoid all violence and your result is natural, intuitive, and complete. Ol’ Constantin clearly had his head screwed on right. This exactly reflects my experience of working with actors on pieces involving mental illness, and also of watching terrible (especially, but not exclusively) student fringe shows. I blame Ophelia for much of this – of which more soon. In fact, as Stanislavsky makes clear here, even if this were the case (which it isn’t), this kind of melodrama is incredibly predictable for an audience. It also perpetuates a whole collection of other and more damaging stereotypes about mental illness (lack of control, tendency to lash out, physical threat etc.). So cut it out. NB 1 – apologies for the lack of acute accents in this piece, my tablet seems to think no-one would ever want to use them. NB 2 – This review contains spoilers. Happily, none of this simplification is present in the tour de force production entitled The Fantasist, playing until the end of the fringe at Underbelly Bristo Square. Theatre temoin, consisting of performers from Britain and France, bring together puppetry, an original electronic soundtrack, and a stunningly energetic lead performance from Julia Yevnine as Louise to explore the contradictions and misconceptions about and within bipolar disorder. The piece opens with Yevnine tossing and turning, her mental distress underscored by momentary blasts of white noise which interrupt the sound of her heartbeat. These interruptions draw the audience into Louise’s world, creating a corollary to her experience without trying to depict it naturalistically – we were given an experiential suggestion of her mental state, without any clumsy attempt to suggest that this is the same as her experience. This experiential approach is combined, through the puppets, with a symbolic rendering of the feelings and contradictions associated with bipolar. A fanciful dance with a blue-velvet-trimmed coat in her wardrobe, and her desire to impress this notional gentleman with her painting leads to her being pursued by, and pursuing, an oversized figure with a hideous green face, as her manic episode grows out of control and she neglects to take her medication. Although bipolar disorder is linked to creativity in this production, as her mania drives her to paint, the company avoid the post-Romantic suggestion that her experience somehow makes her a better artist. A period of depression causes her, egged on by a pterodactyl-like apparition with the same green face as the blue-coated gentleman, to destroy the painting she has been working on while manic. We are shown that this is a repeated pattern, and never get to see what she has actually painted, as the canvas always points away from the audience. While it sanctions medical intervention by showing the result of a failure to take the medication brought to her by the nurse, Josie, the production also avoids the trap of taking a straightforwardly ‘medical model’ approach to mental illness. Mid-way through the show, Louise is warned of the consequences of giving into her mania, symbolised by a drink of blue liquid left her by the green-faced gentleman, by a pair of heads she finds in her wardrobe. Both have ended up there as a result of the gentleman’s courtship, one missing an eye and one having suffered burns. The figures could be interpreted as women who have lost their lives due to bipolar disorder, but even in their pitiful state one argues that following the gentleman is worth it, while the other sanctions caution. At the end of the production, Louise is discovered by Josie attempting to fight off the coat, and is administered an unnamed drug by injection in order to calm her mania. Having calmed Louise down sufficiently, and convinced her that the coat is only a coat, Josie steps out of the room for a moment, at which point Louise, trying on the coat to prove she no longer believes it alive, is dragged into the wardrobe by it. Josie returns and finds Louise missing, although the audience can see that her head has replaced the earlier figures in the wardrobe. It is not certain that Louise has committed suicide, as Josie finds no trace of her, but it is strongly implied, and the ending thus avoids simplistically suggesting that medical intervention is all that is needed, instead bringing medical approaches into dialogue with lived experiences of mental illness and emphasising the lack of a ‘miracle cure’ (another interpretation of Louise’s disappearance could be that it implies a continuing cycle of stability, highs and lows). Theatre Temoin have achieved a remarkable feat in the sensitivity with which The Fantasist treats mental illness, the combination of different styles and media blending to emphasise different facets of the experience of mental illness and bring out the contradictions between them. If you happen to have a spare afternoon left before the end of the Fringe, you could do a lot worse than getting a ticket to this – but hurry, the production I saw today was totally sold out. The Daily Star may win the award for ‘most predictable headline’ in the wake of the killings at the Dark Knight Rises premiere in Colorado – ‘Batman Psycho Kills 12’. Both the Mirror and the Sun referred to James Holmes as a ‘maniac’, as did the Scottish Daily Record. As with Anders Brevik and other mass shooters, the inability to find an explanation for their actions automatically renders them mentally ill in the eyes of the media. However, this ‘diagnosis’ does not remove responsibility in the traditional media narrative around mass killings. Indeed, one of the most interesting features of the Brevik trial has been that the prosecution, rather than the defence, has been pushing for him to be found insane – the defence are keener to demonstrate that he acted rationally as a result of the perceived threats of Islam and socialism. The desire both to label and so understand shocking events like that in Colorado, and to see ‘proper’ justice done under the auspices of the law, rather than medicine, provides the basic ingredients for the conclusion of any ‘superhero’ story, and is especially prevalent in the Batman universe. Jonathan Jones asked, in the Guardian’s blog ‘On Art’, whether the Batman franchise inflicted a ‘sick universe’ on its fans, and although he clarified ‘I am absolutely not accusing the Batman comics or films of provoking this crime’, the very act of raising the question, and the term ‘inflict’ suggested that somehow the films were bleeding out into the psyches of fans. His conclusion, that the camp Adam West tv series represents the most ‘innocent’ and, by implication, ‘moral’ version of Batman, also implies that the modern iteration is somehow ‘guilty’. Of what, Jones does not say. However, part of the reason for this change can be found in the more general development of attitudes towards mental illness. If mental health was though of at all in the earlier iterations of the franchise, it was either as an inappropriately medical approach to a failure of personal responsiblity, or as something which was not well understood, but which certainly shouldn’t be treated with inhumane institutionalisation and personality-sapping medication. Even Enoch ‘Rivers of Blood’ Powell supported the closure of asylums in Britain, and the process of deinstitutionalization in the United States occurred at the same time. Mental illness was not seen to be closely connected to criminality, and so the antagonists in series like Batman were ‘crooks’ or ‘villains’ – possibly psychologically ‘different’ to ‘ordinary Americans’, but not yet explicitly ‘mentally ill’. This was all to change through the 1970s and 1980s (the period over which the Batman franchise became progressively darker). As the treatment of mental illness moved out of secluded hospitals which kept ‘the mad’ away from ‘normal people’, suddenly it became clear that sometimes people with a history of mental illness committed crimes. This led to the establishment in US law of the ‘guilty but mentally ill’ plea (in 12 states), which enables juries to find both criminal responsibility and the influence of a mental illness in the committing of a crime, ending the problems caused when a defendant found ‘not guilty for reasons of mental illness’ was free to go when discharged from hospital. The development of the ‘guilty but mentally ill’ plea occurred in 1975, only one year after the first appearance of ‘Arkham Asylum’ (then ‘Arkham Hospital’) in the Batman comics – even in the early days, the Batman franchise kept pace with, or anticipated, the issues raised by deinstitutionalization for criminal justice. 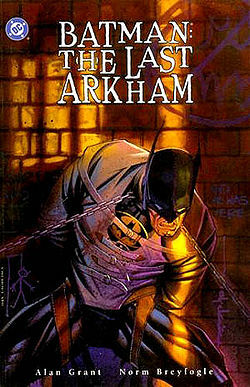 Arkham became more central to the Batman universe over the course of the 1970s and 80s, as well as closer to Gotham, featuring in a number of stand-alone comics and graphic novels in the late 80s and early 90s. 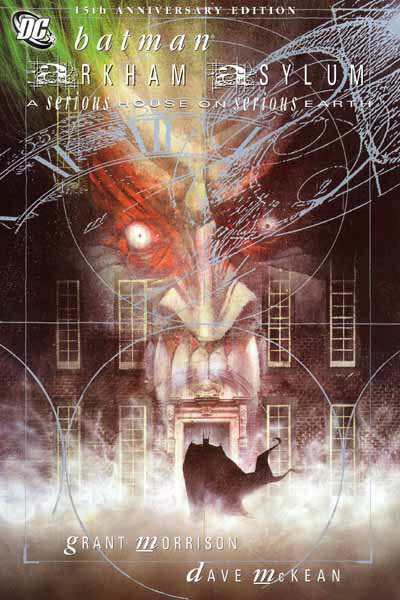 The asylum is depicted as a stereotypical Victorian pile, full of long, narrow corridors, straitjackets and restraints, and is often the setting for exploring questions of how different Batman (troubled childhood, loner, costumed, above the law) is from the insane super-villains he is pitted against. This theme is especially strong in Arkham Asylum: A Serious House on a Serious Earth and Batman: The Last Arkham. These twin concerns again echo and reflect broader questions about conformity and mental illness, as well as partly suggesting a nostalgia for the days before deinstitutionalization, when ‘ordinary Americans’ could be sure that mentally ill offenders would find themselves in an institution with a recognizably penitential aspect – in Arkham, there is little evidence of treatments like occupational or art therapy. In addition the continuity of the Batman stories makes it clear that, for characters like the Joker, or Bane, rehabilitation is not even a distant possibility. Medical staff do discuss rehabilitation, but this marks them out as naïve, and possibly soon to become a villain, as in the cases of both Jonathan Crane (Scarecrow) and Dr. Harleen Quinzel (Harley Quinn). That this representation of Arkham has remained to the present, or at least the 2009 video game, suggests that attitudes towards mental illness have changed similarly little. If anything, the interest in Batman’s own psyche, emphasised in Nolan’s recent trilogy, suggests greater suspicion about possible mental illness even in those who seem to be ‘good’, such as the successful business man and philanthropist Bruce Wayne. While it is easy to blame mental illness, or the ‘sick’ influence of media for events like those in Colorado, it is more productive to realise that these influences do not go only one way – society is reflected in media far more strongly than media has the power the change society. We like to think that perpetrators of mass killings fit a nice narrative pattern, like Batman’s Joker, but the truth is that human beings are complex, and the line between ‘crook’ and ‘ordinary American’, between ‘nice guy’ and ‘psycho killer’ are so indistinct as to sometimes be invisible. Media can help us understand how our societies think, and influence some actions in combination with a plethora of other factors, but it can’t turn life into an easy narrative with superheroes and supervillains – a realisation the Batman franchise suggests may be dawning.